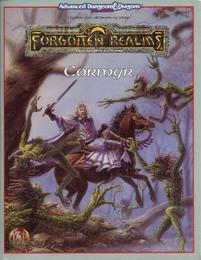 "One of the oldest and most interesting kingdoms on the continent of Faerûn, Cormyr is a land of classic fantasy wherein a strong king rules his subjects fairly and evenly, nobles struggle against each other for the little power the king doesn't keep for himself, and adventuring companies clear forests of ferocious monsters for a small share of the crown's treasury. And - there's magic. Lots of magic. This booklet will allow DM and player alike to wander the King's Forest and the alleys of Suzail in the mind's eye. 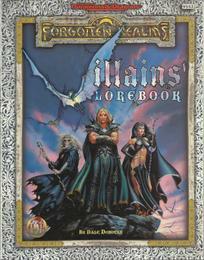 It presents indispensable information for any campaign played in the FORGOTTEN REALMS setting, including military and magical forces, rules for obtaining adventuring charters (required by the Crown), and facts about the War Wizards and Council of Mages. A full-color map of the area details many sites not mentioned in the Campaign Setting, providing the creative DM ideas with which to entertain players for many nights of adventuring." "TSR's most popular world just became even better! 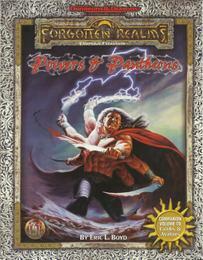 Here are over 30 exciting adventures that can be played in the FORGOTTEN REALMS setting in a single session. Danger, puzzle-solving, humor, and excitement: All lie in wait for intrepid adventurers of every level. All scenarios are ready to play, with little or no preparation by the DM! Enjoy making the acquaintance of beasties from all parts of the Realms, from alguduirs to dimensional warpers, inquisitors to revenants, ring-worms to wemics. The good, the bad, and the ugly (and the not-so-ugly) - they're all here, ready to encounter your party!" "Its waters are the deep purple of the most precious amethyst; its shores hold some of the most dangerous locations in Faerûn. It is the Moonsea, home to Zhentil Keep, the Citadel of the Raven, and thousands of ordinary folk who merely want to make an honest living. Hark to the words of Melandryll Belarod, the bard whose writings form the bulk of this material. He has experienced firsthand the horrors of ruined Hulburg, the desolation of Sulasspryn, and the stench of Mulmaster. His travels aboard Devawing have produced this chronicle of the towns and people of the Moonsea, including both havens and dangers. Belarod knows of the Citadel of the Rave, a ten-mile-long series of fortresses and barracks, site of a terrifying betrayal. He also has evaded the Zhentilar, the crack forces garrisoned at Zhentil Keep. 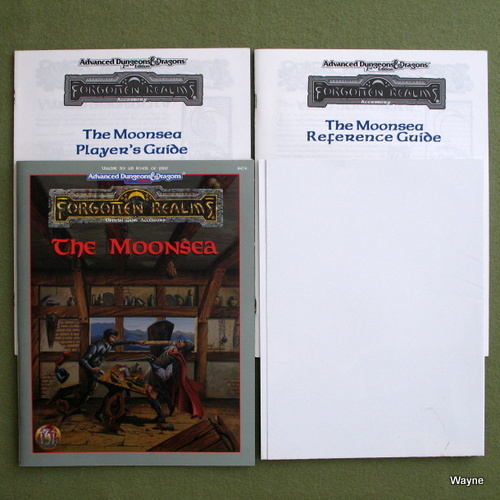 In this product are a 64-page Reference Guide for the Dungeon Master, a 32-page Player's Guide, and a four-color poster map of the Moonsea region." "The Reach has always been considered the breadbasket of the Realms, the birthplace of countless warriors who have shed their lifeblood on the fields of battle. It's also home to noble families that have ruled kingdoms for countless generations, lizardman cities that have existed for hundreds of years, and an ancient plague that still haunts the land. Take a trip to Hlondeth, the yuan-ti city that stands like an emerald beacon over the waters of Vilhon. Visit the gladiatorial arena of Hlath or plunge into the depths of the Deepwash. Feel the political tension that hovers over Shining Arrabar like a poised dagger. But always remember that in the Reach, as in all lands that adventurers tread, not all is as it appears. 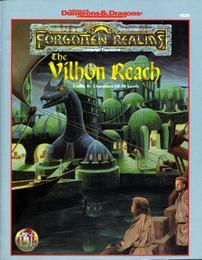 This FORGOTTEN REALMS campaign accessory contains a full-color poster map fo the Vilhon Reach as well as new artwork that brings the reach to life. A 64-page accessory for the Dungeon Master details the lengthy history of the Vilhon, as well as providing current information on the various countries and city-states. A 32-page travelogue provides background for players whose characters would try their hand at adventuring in the Vilhon Reach." "Ever wonder why priesthoods in the Realms continue to flourish, despite the secular power of rich merchants and the land-shattering spells of the archmages? The answer lies in the mighty spells heretofore kept concealed by the robed clery of the cloisters. These sacred spells are now revealed in these pages, drawn from legendary holy books presently "lost" on Faerûn. To read Prayers From the Faithful is to know holy awe and blessed fear at last! Which gems to place into the eye sockets of the carved faces on Gorothir's Girdle to call forth deadly magics. The hallowed album that was used to slay six dragons - and now bears the unblinking, preserved eye of one of them. The divine tome that is a gem that served to lure and slay thieves for over 30 years. Why it's dangerous to hold the Chanting Chain carelessly - and what wakens to its chants. And much more! 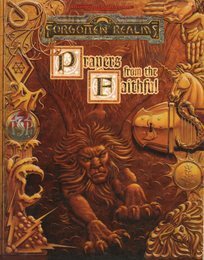 Prayers From the Faithful is an essential guide to the magic of priests in the FORGOTTEN REALMS campaign world, and a useful aid to those portraying priests in any ADVANCED DUNGEONS & DRAGONS campaign." "What can one truly know about a place until he or she has experienced it firsthand? Calimport is a place of many truths, each more disturbing than the last. It is also the most influential trade city in souther Faerûn, wheter its detractors admit it or not. 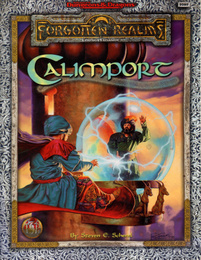 Building on materials from Empires of the Shining Sea, this supplement expands tremendously on what we know about the city that has been the seat of Calishite power since the arrival of the djinni lord Calim eight millennia ago. What can be found inside? The history of Calimport on a broad scale, showing the ebb and flow of power surrounding the city across time. A sweeping look at the city itself, including all of its landmarks, wards, and sabbans (districts), providing for the first time the key to finding ways through a city of more than two million people. A close-up view of the Eraré Sabban and its Taorahl Drudach, a waterfront district and neighborhood designed to be a central base in your own Calimport campaigns. Everything you need to know about the peril-riddled alleys, palaces, and underworld of the most dangerous city on Faerûn is contained within this 96-page book. Walk the dark paths among the sabbans or fly among the gilded minarets, but know that a thousand eyes and a thousand intrigues swirl about you at any moment! Come explore one of the oldest cities of Faerûn. The trip may change your life..."
"For years beyond measure, folk of Faerûn have sailed and swum the Inner Sea from the Lake of Dragons to the Alamber Sea, but few believed there was more here than a vast expanse of blue water filled with fish, a few sea monsters, and ever-present pirates. Come, take another look and discover new worlds above and beneath the sea. Once you enter the Sea of Fallen Stars, you may never want to go home again. Atop the Waves: Examine life on the Inner Sea from the major ports and common superstitions to the goings-on in the Pirate Isles. Beneath the Seas: Discover the worlds within the Sea! Visit Serôs, an ancient land. Meet the enigmatic shalarin, a magical sea people from unknown oceans. Join the mysterious Dukars, magical defenders of the depths. Myth Nantar, City of Destinies: Wrapped in a magical mythal, the elven city of Myth Nantar is the perfect place to make the transition to the world under the waves or to begin a complete aquatic campaign. 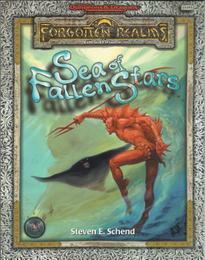 Sea of Fallen Stars is the first fully developed underwater setting for AD&D campaign play. It provides a focus for the use of the rules supplements Of Ships and the Sea and Sea Devils, but neither of these products is needed to use this book. Contained in these pages is everything you need to adventure in this exciting world. Bring your game beneath the waves with rules and magic that make is easy and fun to do, or create sea elf, merman, triton, locathah, or shalarin PCs using the character-creation rules herein. Either way, get ready to explore Netherese ruins, sunken ships, and abyssal trenches in the Sea of Fallen Stars!" "The place has many names: the Underdark, Deepearth, the Realms Below, the Night Below, the Lightless Lands. This vast world beneath the surface is home to fabled races such as beholders, cloakers, drow, illithids, and ixzan. Menzoberranzan, the dreaded City of Spiders, is only one of the hidden cities of the Underdark. 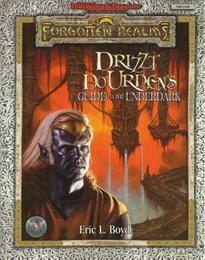 With Drizzt Do'Urden as your guide, a whole new world opens beneath your feet." "More than just powerful wizards, divine temples, and wise kings comprise the Realms. For every beacon of light there exists a shadow, and shadows conceal much. Those who work in secret wield much power in Faerûn: Groups as diverse as the Harpers and the Zhentarim all live and work in the shadows of the Realms. * The bizarre details of the "Manshoon Wars"
This book also gives information on the Night Masks, the Knights of the Shield, the Iron Throne, the Shadow Thieves, and many more secret societies. Finally, Westgate - the nexus of many power groups' interests on the Sea of Fallen Stars - is detailed as never before. Learn what goes on in the shadows of the Realms; learn the secrets they don't want you to know!" "They are the stuff legends are made of. In fact, they are the legends. 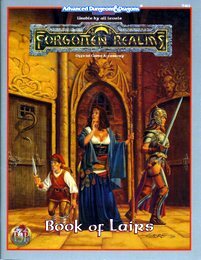 The major characters who have fought - and in some cases died - for the sake of goodness and justice in all parts of the FORGOTTEN REALMS campaign world are chronicled for posterity in Heroes' Lorebook, a 160-page compendium of the heroes whose exploits have filled dozens of novels over the past decade. Inside you'll find updated game statistics and descriptions for Elminster, Drizzt Do'Urden, Alias, and many other characters who appeared in the Hall of Heroes collection published in 1989, as well as a host of brand-new biographies for heroes such as Brianna and Tavis Burdun, Alicia Kendrick, Cadderly, and Danica, who have never been featured in a game product until now. 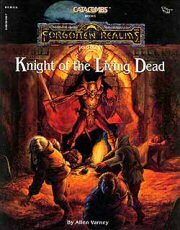 No collection of FORGOTTEN REALMS gaming literature is complete without this "Who's Who" of the people - and creatures - who have prevented the forces of evil from having their way." 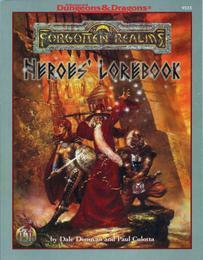 "These are the characters who have tested the mettle of the foremost heroes of the FORGOTTEN REALMS campaign world. They spread chaos and death wherever they venture, ruining whatever they touch. And they're coming to your campaign! * Artemis Entreri, the nemesis of Drizzt Do'Urden. * Fzoul Chembryl, high priest of Iyachtu Xvim. * Szass Tam, Zulkir of Necromancy in the Red Wizards of Thay. * The Xanathar, the beholder crimelord of Waterdeep. * Halaster Blackcloak, the mad master of Undermountain. This 'Who's Who' of the evildoers of the Realms is a valuable addition to any campaign." "What makes a god a god? How are divine powers created, and how do they die? How powerful is a greater diety compared to a lesser deity? 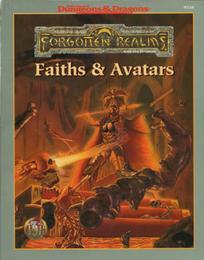 These questions and many more are answered for the FORGOTTEN REALMS campaign setting within Faiths & Avatars. 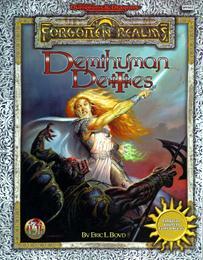 Detailed in this 192-page core supplement are the most prominent religions and deities of the Realms. Each divine power is covered in depth by an entry that includes information about the deity's appearance, personality, worshipers, portfolio, aliases, domain name, superior, allies, foes, symbol, woshipers' alignments, avatar, manifestations, church, and specialty priests. The information on each relgion includes its core dogma, day-to-day activites of priests, holy days and important ceremonies, major centers of worship, affiliated orders, and the priestly vestaments and adventuring garb of members of the clergy. 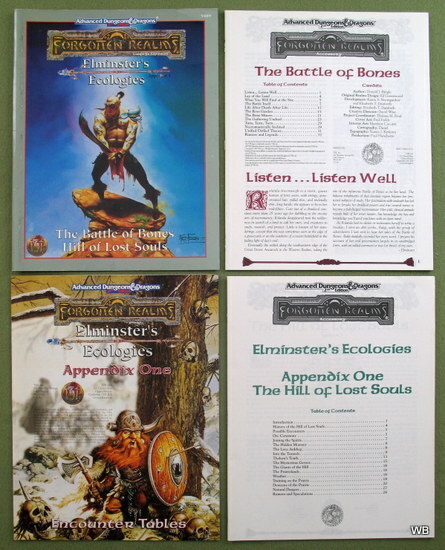 Finally, each entry contains spells specific to each of the relgions - some new, some long unavailable or hard to find, and some updated to conform with the current AD&D game rules. • All the greaters, intermediate, and lesser deities of the Faerûnian pantheon. • The honored dead, including Bane, Bhaal, Moander, Myrkul, and Leira, among others. • Expanded and clarified specialty priest classes and specific spells for all relgions with priesthoods. • Color illustrations of priests from every faith in ceremonial dress. • Four additional general priest classes now official to the FORGOTTEN REALMS campaign setting: crusaders, monks, mystics, and shamans." "This esential supplement follows on the heels of Faiths & Avatars. which detailed the rules by which deities function in the Realms, and describes more of the relgions and powers of the Realms. Each divine power is covered in depth, and each entry has information about a deity's appearance, personality, worshipers, portfolio, aliases, domain name, superior, allies, foes, symbol, worshipers' alignments, avatar, manifestations, church, and specialty priests. The information on these faiths includes their core dogma, day-to-day activities of priests, holy days and important ceremonies, major centers of worship, affiliated orders, and the priestly vestaments and adventuring garb of members of the clergy. Finally, each entry contains spells specific to each of the faiths. • The demipowers of the Faerûnian pantheon: Finder Wyvernspur, Savras the All-Seeing, Sharess, Valkur the Mighty, Uthgar, Ulutiu, and others. • The powers of the Mulhorandi, Chultan, and the deceased Untheric pantheons. • Expanded and clarified specialty priest classes for all relgions and priesthoods. • Religion-specific spells for all faiths with priesthoods. • Five showpiece temples of the Realms detailed with illustrations, color maps, and extensive descriptions of their locales, inhabitants, histories, and interiors. • The three known Elder Elemental Evils of the Realms described in MONSTROUS COMPENDIUM appendix form." "This esential supplement is a companion to Faiths & Avatars and Powers & Pantheons, which detailed the rules by which deities function in the Realms. Demihuman Deities describes the demihuman relgions and powers of the Realms: those of the elves (including the drow), the dwarves, the gnomes and the halflings. Each entry includes information about a deity's appearance, personality, worshipers, portfolio, aliases, domain name, superior, allies, foes, symbol, worshipers' alignments, avatar, manifestations, church, and specialty priests. The information on these faiths includes their core dogma, day-to-day activities of priests, holy days and important ceremonies, major centers of worship, affiliated orders, and the priestly vestaments and adventuring garb of members of the clergy. Finally, each entry contains spells specific to each of the faiths. • The powers of the drow and elven pantheons, including Lolth, Ghaunadur, Vhaeraun, Eilistraee, Corellon Larethian, Hanali Celanil, Rillifane Tallathil, Labelas Enoreth, and others. • The mysterious Triune Goddess, Angharradh, who is a combined form of Sehanine Moonbow, Hanali Celanil, and Aerdrie Faenya. • The powers of the dwarf, gnome, and halfling pantheons, including Moradin, Clangeddin Silverbeard, Haela Brightaxe, Garl Glittergold, Baervan Wildwanderer, Flandal Steelskin, Yondalla, Arvoreen, Cyrrollalee, and others. • Color illustrations of priests from nearly every faith in ceremonial dress." TSR used a different, cheaper paper for this book. The result is that all the copies I've seen nowdays have noticeable page tanning. 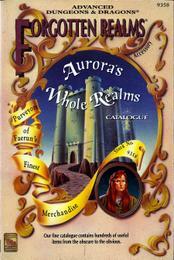 A shame, because Aurora's Catalog is one of AD&D's hidden treasures, if you love the gear like I do. "At last! Complete in one catalog, all the finest merchandise Faerun has to offer is presented by the enterprising entepreneur, Aurora the Eclectic. Useful for players in any AD&D fantasy campaign (and other role-playing games, too! ), this is a handy listing of items and goods of all kinds, from farming tools to scribes' pens, from imported Shou Lung silks to Maztican cotton, from wines and ales to breads and cheeses. Prices are given in the gold piece standard, for simple conversion. Players' "shopping trips" will never be the same! It is our hope that players and DMs will find this Catalogue both useful and enjoyable. Aurora is not above editorializing about her wares, but we think her opinions will be informative as well as entertaining." "The entire planet of Abeir-Toril has been laid out before you with this completely interactive atlas. 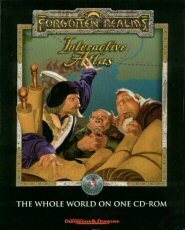 Explore never-before-seen realms, sprawling cities, treacherous overland routes, perilous dungeons - or more than 500 maps from FORGOTTEN REALMS adventures. Examine the maps of entire continents, or zoom in for local details. Players and DMs alike can print out every square foot, mile, and quadrant to accentuate their roleplaying adventures. Everything is customizable. DMs can modify existing maps and add new levels of detail using the AD&D Core Rules Version 2.0 CD-ROM or ProFantasy's Campaign Cartographer 2. The more than 500 new map symbols are available to use in your own maps as well. 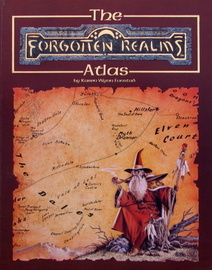 Put the power of the FORGOTTEN REALMS Interactive Atlas at your disposal and see a new level of detail in your adventures." "Dirt fouls your nostrils and mouth as you reach the inevitable conclusion: You yourself, once a holy paladin, have become one of the hateful undead! But you have no idea who you are or how you got here. . . .
One thing is certain, however: Before you can escape your present state, you must stop the legions of undead, who even now labor feverishly to complete a monstrous underground construct that will spell doom for the entire population of Waterdeep and possibly all the Realms! In KNIGHT OF THE LIVING DEAD, you enter the world of a visual maze, full of sinister surprises! As an undead paladin, you recover the pieces of the wondrous Staff of Waterdeep, but to complete the staff, you must explore underground tombs where fearsome undead creatures lurk around every bend! A unique feature of this book is your need to discover your Memory Traces, which will not only tell you who you are, but also may provide clues in your desperate hunt! 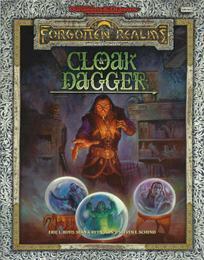 CATACOMBS™ Books represent the ultimate challenge in role-playing adventure. Through lavish illustrations, you journey from chamber to chamber in search of the precious object of your quest. Your analytical powers are tested to the utmost as you must decide how to deal with the weird and wondrous creatures and artifacts you encounter." • Introduces the reader to the organization of the eight area-specific booklets. • Provides color-coded encounter tables for the eight other booklets along with instructions for their use." 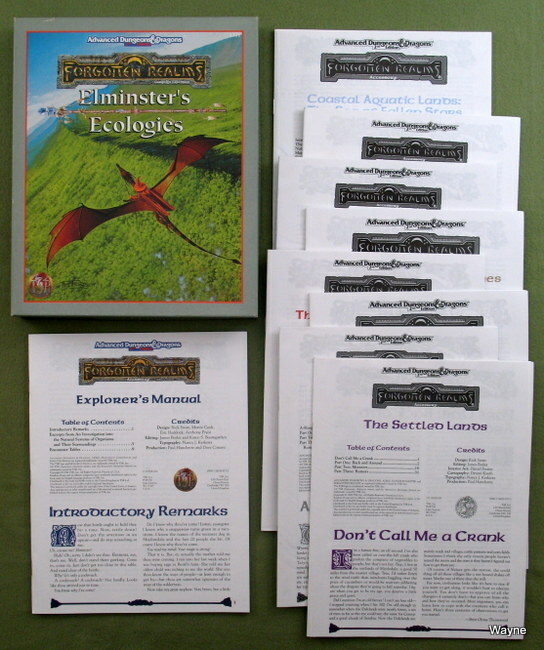 These materials follow the same format as the original Elminster's Ecologies boxed set and mesh with it perfectly. Elminster himself has even thrown in a few personal notes. So read on, traveler, and learn all the secrets of these mysterious locales!" • a brief booklet of tables to aid the Dungeon Master in determining random encounters for adventurers whose travels take them through these areas. 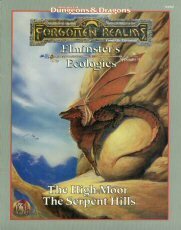 Those planning to explore these regions would be well advised to read the works herein to prepare themselves for the reptilian dangers of the Serpent Hills and the hazards of the High Moor - from its beasts to its protective druid itself!"